RIO DE JANEIRO, BRAZIL – The FipeZap Index, which measures the changes in price of property in twenty cities across Brazil, has released its monthly figures which show that in November the market largely remained stable, with a drop of only 0.05 percent. However, the average price per square meter of properties advertized for sale in Brazil between January and November this year presents a real decrease of 7.44 percent after inflation is taken into account. Real-estate prices dropped in Brazil in 2015 but prices in Rio de Janeiro remain the most expensive in the country, photo via Rio Exclusive. According to the IBGE (Brazilian Institute of Geography and Statistics), the rate of inflation for the period was 9.47 percent, while the average price of real estate changed by only 1.32 percent in the year. Since the general rise in prices was greater than the fluctuation in the price of real estate an overall drop is registered for the year. The average price per square meter of the twenty cities included in the survey was R$7,609. 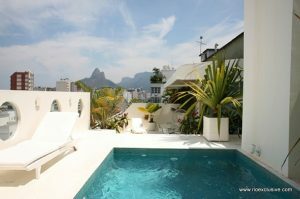 Rio de Janeiro, as ever, was the most expensive location, with an average price of R$10,458 per square meter advertised for sale. By comparison real estate in Contagem, in Minas Gerais, was the cheapest at R$3,551 per meter-squared. Eight of the cities surveyed experienced a nominal decline: Florianópolis, Rio de Janeiro, Belo Horizonte, Recife, Contagem, Salvador, São Paulo and Brasília. At an event promoted by Secovi and the International Federation of Real Estate (FIABCI) on Wednesday December 2nd, Bernardes said the industry was facing a difficult period. “The message that I can give to you is that the days will not be easy for the next two years at least,” he said. The real-estate sector is being affected by four compounding factors: high unemployment, rising inflation, insufficient wage increases and falling consumer confidence which all result in the banks becoming increasingly reluctant to lend money. As the market drops, however, opportunities are arising for buyers. Many companies are offering promotions, as they did during Black November, in order to shift stock and discounts are being offered for those who can pay in cash. There is also the possibility that political factors, like the beginning of the impeachment process against President Dilma Rousseff, and big events, like the Olympics, will affect real-estate prices. Not to sure who to ask but I want to invest in property in Guarapari in the state of Espirito Santo, who do I contact !